Skulls (or calavera) originates from Mexico. Day of the dead (Dia de los Muertos) is a Mexican holiday held in early November. Skulls were traditionally made out of clay-molded sugar, decorated with feathers, colored beads, foils and icing. They’re a beautiful inspiration for this fun dessert idea. The idea of this tradition is that the Mexican families choose to celebrate the lives of their dearly departed friends and relatives as an opposite to most cultures that tend to mourn the dead. In terms of meaning, the skull symbolizes death but in a positive manner. 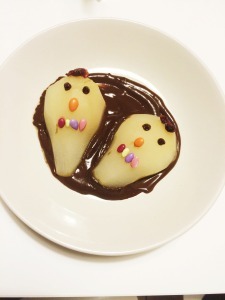 This time of the year is a great way to use some ideas to make your own skulls with fresh pears as a dessert. Feel free to change the decoration ingredients and be creative making your own skulls! Pre heat the oven at 400 F.
Place the pear halves cut-side down in a backing dish 13 x 9 – inch side. Pour the water over pears. Cover the pan with aluminum foil. Bake the pears for 30 minutes or until tender. Uncover the pears to cool. Combine evaporated milk and chocolate in a small saucepan over medium-low heat. Stir until chocolate is completely melted. Add the coffee and blend until dissolved. Place about 2 tablespoon chocolate and coffee sauce in a bowl and place a pear cut side down on top of the sauce aside. Repeat with remaining pears and sauce. Decorate face pears like a skull. Put a cacao bean on top of each pear. Then add two eye pieces with the chocolate morsels. Use a pumpkin seed like the nose and the sprinkles (or red licorice) for the teeth. Serve immediately.